Recently, I've been getting asked for suggestions on the can't miss attractions at Walt Disney World. There are so many things you can do at each of the 4 parks that it can seem overwhelming. This got me thinking and so I asked my daughter, who has been to Disney World several times only at the age of 5. Here is my daughter's top five list! She has loved this ride since before she was 1 and it's a classic. There is something magical and happy about this ride that opens up their little eyes. It's located in the Magic Kingdom in Fantasyland. This is a can't miss! Seriously, your kids will love this just as mine did. We always plan this one ahead as it's only offered on certain days and at certain times. The sparkly lights at night with the famous Disney characters drive the kids insane! In a good way, that is. It's a classic and it's fun! They recently revamped this attraction. This is more of an adventurous ride as the height can be intimidating to little little kids. Bella is not a fan of "thrill rides" but still enjoys this one very much. This one is such an adventure for young kids. It's so much more than a Zoo and you feel like you are really on a safari in this open atmosphere. We have always had the most luck of seeing the amazing animals if you go right when the park opens. This ride is located at the Animal Kingdom Park. These are a combo as they are kind of the same but with different movie themes and both are great for young kids. The Little Mermaid ride is at the Magic Kingdom in Fantasyland and the Nemo ride is at Epcot. Okay, this is actually number 6 and it's not really an attraction but my kids love doing this so I just had to mention. The kids love wearing their costumes at the parks. You can find some pretty affordable princess outfits that wont break the bank ahead of time at Target or Walmart. You can even get a coordinating outfit that resembles a character and the kids will be excited. I would recommend bringing some loose clothes for them to change into just in case they get hot in the dresses. The ride itself can be a tad outdated but the kids still love the black florescent scenes. The main attraction with this ride is actually waiting in line. They have fun games and activities throughout the line to keep the kids occupied and entertained. Have you traveled to Disney World with your little one's? What are their favorite attractions? Leave your comments below! Posted on January 12, 2015 by Katie De La and filed under Travel, Disney and tagged #magicalmondays Walt Disney World disney family vacation magic kingdom magical mondays traveling with kids. It's located in the Hollywood Studios theme park right across from Echo Lake. The character buffet is also offered for lunch as well, although, breakfast is cheaper at 30 per adult. We were so excited to dine with the Characters from Disney Jr at the Hollywood Vine Restaurant located in the Hollywood Studios theme park! I have to say, if you have kids that watch Disney Jr. they will love this character breakfast more than the others! We decided to do an early breakfast so we could play in the park the rest of the day. It was very good and offered plenty of options for all tastes such as waffles, eggs, fresh fruit, yogurt bar, frittatas.... I could go on but you get the idea. There is also a ice cream sundae bar that the kids will love! Its set up like a 50's diner with the plastic and sparkly couches. The dining experience also provides some musical entertainment and dancing on the part of the characters in costume. Kids can get up and dance along with their favorite characters. Overall, I would say we enjoyed this character breakfast the most! The characters are much more familiar to the kids and the food was great!! Have you tried the Hollywood and Vine before? Have you tried a different character breakfast at Disney World? I'm curious as to what everyone else has tried! Posted on December 22, 2014 by Katie De La and filed under Disney, Travel, Family and tagged Disney jr. Walt Disney World character dining disney bucket list disney style disney vacation family vacation travel traveling with kids. I had the opportunity to check off one of my dating bucket list items on our recent family vacation to Disney World! I wasn't sure if we would get the opportunity to spend some time alone and it magical happened!! , not over the phone. We learned this the hard way as we scrambled on the internet via our phones. We were lucky to be able to make the reservation that morning. Everyone at the restaurant is from the country of France so you genuinely feel like you are there. There is a low light ambiance that makes this restaurant intimate. That is one of my favorite things about Disney World. You always feel like you have escaped reality and you are somewhere else in different place or time. The food was amazing! I mean AMAZING! I haven't had a meal like that in a long time and it was well worth the price. They even brought out these cute little loaves of french bread for the table. The meat was very tender and juicy almost like butter melting in your mouth. The potato gratin was very creamy and delicious as well. The green beans were cooked so perfectly and lightly buttered. All together the meal was heaven! I enjoyed dipping some of the potato in the peppercorn sauce. It was so subtle an not overwhelming at all. Of course I paired my steak with a glass of Pinot Noir. for some chocolate croissants and coffee. Unfortunately, it was closed by the time we finished our meal. Poor planning on our part but the evening was still amazing. I would definitely suggest this restaurant as I'm sitting here dreaming about the delightful cuisine. The atmosphere was very real and I would even recommend taking the kids as they have a wonderful kids menu. What I enjoy as well was that this restaurant wasn't too stuffy. Since it's inside the park you get a variety of fellow dinners from the sun soaked park hoppers to the date nighters like the hubby and myself. You can dress this evening up or just enjoy a fabulous meal. It's up to you! Have you every dined at Les Chefs de France? What did you think of the digs? What other restaurants have you enjoyed at the parks? Let's have a discussion in the comments! Posted on September 10, 2014 by Katie De La and filed under Dating Your Husband, Travel, Disney and tagged Les Chefs de France Walt Disney World date night disney romance disney vacation epcot foodie review french cuisine marriage romance restaurant review. Magical Monday: Our Magic Bands are here!! This seems to be the start of the 3 week build up to our Disney Vacation! Looks like Disney didn't realize that we're resort hopping this trip. Resort hopping is one of my favorite things to do. You get a feel for the many resorts and they're all so very different and unique. We have already stayed in two out of the three. We are new to the Art of Animation Resort and we really wanted to try out the pool! I can't wait to write a review for ya'll! I'm getting a little anxious as this is the first time we will be road tripping it with our kids. We decided to drive this time due to plane ticket prices soaring in the past year and our littlest no longer flies for free. They can barely stand being in the car for 45 minutes so I'm a kind of terrified for this drive. for the back seats. They each get their own and we have a large collection of Disney DVDs to last through both there and back. activity trays that just so happened to work nicely over there car and booster seats. Welcome to Magical Monday Link up!!! Magical Monday is a link up dedicated to any and all things Disney. Every Monday we will be here to share our favorite moments and posts. It can be a post about a review from the parks, a craft, recipe or just a heartfelt memory. Whatever it is (past or new) link up those Disney inspired posts!! This will be pretty simple. 1. Just link up your post below. 2. Add the Magical Mondays button to your post or a simple link will do. 3. Visit other participants and start sharing! Posted on August 11, 2014 by Katie De La and filed under Disney, Travel, Family and tagged #magicalmondays Walt Disney World disney vacation family vacation magical mondays road tripping. First Ever Magical Mondays Link up!!!! Welcome to Magical Mondays Link up!!! The world of Disney is something that is very close to my heart. I'm a former cast member and frequent vacationer of Walt Disney World. We are so excited to be going back in 4 weeks and I can't wait for this adventure. To count down our trip and continue on with the spirit, Magical Mondays is a link up dedicated to any and all things Disney. Every Monday we will be here to share our favorite moments and posts. It can be a post about a review from the parks, a craft, recipe or just a heartfelt memory. Whatever it is (past or new) link up those Disney inspired posts!! Posted on August 3, 2014 by Katie De La and filed under Disney and tagged #magicalmondays Walt Disney World disney vacation disney linkup magical mondays. I've been lagging on the Magical Mondays series so far. Fail on my part! I'm really excited to pick this back up and start sharing with you because our Disney Vacation is coming up in 5 weeks!! Join me next Monday for a Magical Mondays Link Up! 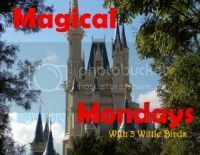 Next week, I plan to include a link up with Magical Mondays so I hope you all join along and share your favorite Disney posts, past or something new! These pieces are just a small bit of what I like to think as my eclectic style. I hope you join me next weeks Magical Mondays for my first blog link up !! Posted on July 27, 2014 by Katie De La and filed under Disney and tagged #magicalmondays alice in wonderland disney home disney style home decor magical mondays. Even though I have been here over a dozen times, there are still a few things I have not been able to experience personally or with my family. For this week's Magical Mondays, I am highlighting my bucket list for our Disney Vacation in September. 3. The New Snow White Ride.. Just opened up! 5. Dole Whip in Adventureland at the Magic Kingdom. 10. Downtown Disney shopping... I need a new coffee mug! 15. Afternoon tea at the Grand Floridian... they have a tea party for the little ones! There are endless things to do at Walt Disney World resort, so it's important to plan in advance and know what you want to see and do. Otherwise, you will miss out on some of the timed parades and shows. I'm all for just winging it but this really is not a place you go to without a plan... unless you go multiple times:). Posted on May 5, 2014 by Katie De La and filed under Disney, Travel and tagged #magicalmondays Walt Disney World animal kingdom disney bucket list disney vacation dole whip epcot family hollywood studios magic kingdom magical mondays. Being an avid Disney vacationer, a former Disney College Program Cast Member and graduate, and daughter to vacation club members.... We travel to Disney World.... A LOT! I've been blessed to have experienced such amazing resorts in our travels to the vacation spot that is practically a city in itself. For countdown to our next Disney Vacation this September 2014, I thought I start my very first series to celebrate one of my favorite places in the world. I feel like I'm missing some, seeing as how the number of Resorts Disney offers seems endless! Keep in mind, the Villas at each resort is only available to DVC (Disney Vacation Club) Members. stays would have to be.. The Beach Club Resort is located in a prime area around the Crescent Lake. Within this resort area there is a short walk around the lake to the Board Walk Resort, The Yacht Club, and The Swan and Dolphin. It's also a short walk to the back entrance to Epcot where you will enter right in the heart of the World Showcase. This would be ideal if you just wanted to bop on by one of the amazing restaurants for an evening meal. There is also a short boat trip that will take you to Hollywood Studios! This location is my absolute favorite and offers many entertaining options outside of the Resort. One of the best things about this resort is the pool!! Stormalong Bay is a playground of water activities for both child and adult. It is the only pool that offers a sandy beach where young children can hang out and build sandcastles. My girls enjoyed this pool so much and still talk about it to this day. Character Breakfast Buffet to die for! Character breakfast anyone? Instead of having to travel to find one of these Disney vacation musts, you can have the option of walking to one in your own Resort!! Cape May Cafe is a fantastic restaurant that offers the Famous Character Breakfast buffet with options for any picky eater, including the Mickey Waffles! You will want to make advanced reservations for this one. Endless supply of dining options through Epcot and the other resorts and restaurants located on Crescent Lake. Cape May Character Breakfast Buffet! We had the luxury of experiencing the one bedroom villa suite with a garden view. The Villa's are offered to the Vacation Club members and they are fantastic. The whirlpool tub and bathroom were huge and the villa resembled that of a beach home. The general area included a couch with a sitting area and TV, a dining area with a full kitchen. A full kitchen is great if you are staying a couple days and don't want to spend all of your money vacation money on food. You can have a service deliver groceries and stock up on late night snacks and easy meals. The Beach Club is packed with activities and areas for all ages. It really is a resort for anyone. I hope you enjoyed this weeks Magical Monday's! This review expresses my personal experience at The Disney Beach Club Resort and Villa. I was not compensated for this post, I was just so impressed with the resort that I had to share. Have a Magical Monday everyone! Posted on April 14, 2014 by Katie De La and filed under Disney, Travel and tagged Walt Disney World beach club resort disney vacation dvc member family favorites magical mondays mickey mouse vacations. Last week, I posted my daughters 5th Tangled birthday party! I have gotten several emails on the cupcake tower and thought I would explain in more detail how I created this feature. I first decorated the bird house to resemble tower from the movie. I used purple and blue paints for the roof. I used tan and brown for the sides of the tower. I created the vines effect and flowers. This adds a little dimension to the house that was missing before. I used a Pringles can for the tower. First, I coated with a base in medium gray. Then I took a thick brush and filled in the bricks with both darker and lighter tones of gray. To assemble, I flipped the can over and used a hot glue gun to attach the house to the bottom of the Pringles can. Then I placed the open end of the can over the serving platter handle. to hang out of the peep hole in the bird house, like I did above. I just used yellow yarn. This is a great way to add a personalized touch to a party with out spending a whole lot of money. The best part, you get to use the serving platter for future parties! Posted on March 14, 2014 by Katie De La and filed under Celebrate, Disney, Create and tagged Celebrate parties on a budget tangled cupcake tower tangled party decorations. I created last week that I thought it would be fun to continue on with the theme and do something Italian! When I think of Italian and Disney movies, I picture Lady And The Tramp. Please enjoy this free printable play menu for your pretend play activities. Posted on March 10, 2014 by Katie De La and filed under Family, Disney and tagged disney movie disney free printable homeschool lady and the tramp play menu pre k pre-k pretend play.